A new wearable Bluetooth earpiece has been gaining traction on the crowdfunding site Indiegogo, recently surpassing $1 million in funding and easily breaking its original goal of $75,000 from its backers. Called the "Pilot," the insertable earpiece translates languages in real time between users speaking with one another, all through a connected smartphone app. The Pilot comes with two earpieces, and when used together the system can function as a traditional set of wireless earbuds with basic audio and music playback through a Bluetooth-connected smartphone. When in need of its translation ability, users can hand off one of the earbuds to another person so their conversation is filtered and translated to each user through the Pilot's real-time language translator. 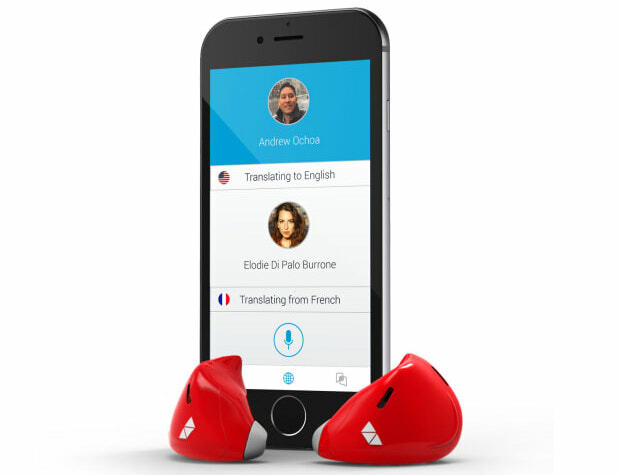 To start off, the earpiece's creators -- Waverly Labs -- will include language packages for English, Spanish, French and Italian, with other languages introduced as paid downloads in the future. The app will initially be required to connect online when it launches this summer (as a basic translator sans Pilot earpieces), but will eventually store its language database offline so users won't have to worry about a constant internet connection fueling Pilot. There's even an option to funnel the translated conversation through a smartphone's speaker so everyone nearby can hear what a foreign speaker is saying. The Pilot's FAQ mentions that translation isn't currently perfect, but that the more people use the device, the smarter Pilot will become. There's also "a couple of seconds of delay" between when a user speaks in their native tongue, and when it is translated to the second Pilot earbud wearer, which Waverly Labs says will be an aspect of the device it works hard at shortening through app updates. Although there were early bird specials at discounted prices, all of them are sold out. Pilot is currently selling for $199 as a pre-order on its Indiegogo page. With that bundle users will get the two earpieces, a portable charger, and three different sized eartips. Other backer levels include bundles of extra Pilot earpieces, and the chance to meet the team at Waverly Labs and get a glimpse behind the scenes of the technology's creation. The Pilot could be delivered, at the earliest, by Christmas of 2016, although Waverly Labs is telling backers to expect the first shipment of Pilot earpieces to arrive in Spring of 2017. Nice, I need this so that I can understand my wife. I never get what she is talking about and we've been together 6 years already. "It was difficult for us to communicate because she didn't speak English very well." He's the one on vacation in a French-speaking country, but she's expected to know English? Dude.... no man will ever understand women. Just nod and say "yes dear" like the rest of us. This is a great idea, but it for it to be successful the lag can't be too much. I can't imagine many people will want to put something in their ear that was just in someone else's ear..... Especially a stranger.... Good idea, poor form factor. A small speaker to hold next to the ear for the other person sound more hygienic. Another Star Trek prediction coming true - although a bit nicer than the original. this will be massive as my girfriend is russian and i am canadian. Her parents and I can barely communicate. On the other hand I wont be giving them $199. I'd rather wait to see what the product truly is in production and give them $400 than waste more money on indigogo. The fun is actually in learning and using a foreign language, not listening to robot translations.